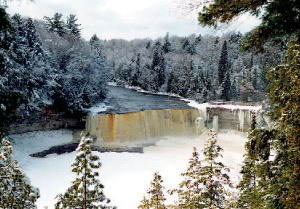 The Upper Falls at Tahquamenon Falls is the most popular snowmobile destination in the Upper Pen­insula. Some just admire the impressive ice formations of the partially frozen falls. Everything you need to know to slip, slide, dine, drink and laugh your way across the Great Lakes State, beat cabin fever … and let the dogs out. For a tasty winter escape, slide your way to the Garland Resort (877-442-7526;www.garlandusa.com), southeast of Grayling, and indulge in a Nordic adventure that combines cross-country skiing and eating. In the Gourmet Glide, staged every Saturday from Jan. 14-March 4, skiers follow the resort’s well-groomed trails, stopping along the way at five buffet stations to feast on smoked trout, cheese fondues, spiced wine and other treats. $59 for adults and $27 for children. Package deals, including lodging, start at $157 per person. Nestled near the top of Michigan, in the far reaches of the Upper Peninsula, is America’s second-largest waterfall east of the Mississippi River. If Tahquamenon Falls is impressive during the summer, you should see this cascade in the winter. So many people do in fact, that the staff at Tahquamenon Falls State Park (906-492-3415) plows the paths and stairways leading to the 50-foot plunge right through to spring. Make the trek to view the partially frozen falls – and the huge ice formations it creates – and then refuel with a suds and whitefish dinner at Tahquamenon Falls Brewery (906-492-3300) located in the park. On Saturday, be prepared to wait for a table. When the sun goes down, cross-country skiing takes on a romantic look at three state parks. In Michigan’s “thumb” on Saginaw Bay, Port Crescent State Park’s (989-738-8663) Candlelight Ski Run includes more than a mile of trail lined with candles in milk jugs and refreshments by a bonfire. Nearby, Albert E. Sleeper State Park’s Candlefest (989-856-4411) is also a popular spot. And, on the other side of the state, Hartwick Pines State Park (989-348-7068) near Grayling is renowned for its nighttime skiing. Call the parks after mid-December for the exact dates and snow conditions. For the best view of the Canadian winter, board the well-heated Snow Train of the Algoma Central Railroad (800-242-9287 or www.agawacanyontourtrain.com) in Sault Ste. Marie, Ontario. The daylong 228-mile trip winds through a rugged winter wilderness, finishing with a long descent into spectacular Agawa Canyon before turning around. The amount of snow you see is not just beautiful but mind-boggling. The Snow Train departs every Saturday from Jan. 28 to March 11. Adult fare is $57; children are $30. Numerous hotels in Sault Ste. Marie offer reasonable weekend deals, including train tickets. Michigan’s longest sled-dog race, the U.P. 200 (800-544-4321 or www.up200.org) is a great reason to visit Marquette Feb 17-19. The 240-mile race, which is a qualifier for Alaska’s renowned Iditarod, begins Friday when up to 40 mushers and their 12-dog teams depart to the cheers of thousands of bundled-up spectators. Once the race is under way, it’s time to party in downtown Marquette. Weekend fun includes fireworks, music, an outdoor art exhibit and plenty of activities for kids. You’ll be exhausted by Sunday, when teams race to finish in town. If watching mushers isn’t satisfying enough, you can run your own team through the Upper Peninsula with the help of Wilderness Trail Outfitters (906-280-6612 or www.wildernesstrailoutfitters.com) based near Escanaba. Wilderness Trail Outfitters has a kennel of 56 Alaskan huskies and offers custom dog-sledding adventures over 300 miles of trails. The tours – which will have you barking out commands to a team of dogs from the back of a sled – range from a two-hour spin for $65 to an all-inclusive package with two days of mushing, meals and two nights of accommodations for $495 per person. Tours run Dec. 1 through April. Snowmobilers, both novice and expert, are religious about stopping on Sunday mornings at a hot spot northeast of Traverse City. The East Jordan Snowmobilers Clubhouse is renowned for its “Snow Lovers” breakfast – a plate heaped with eggs, sausage, ham, pancakes, potatoes, toast; you name it. Once you fuel up, hop on your sled and hit the Jordan Valley Trail. Follow the signs south to Pinney Bridge Road, and you’ll find a 33-mile forest road that isn’t plowed in the winter, making it the most scenic snowmobile trail in the Lower Peninsula. For trail maps, sled rentals or more information, contact the East Jordan Chamber of Commerce (231-536-7351 or www.ejchamber.org). Anyone with a snowmobile is welcome to join the 41st annual Moosejaw Safari, Michigan’s oldest snowmobile event. Hundreds are expected to rev their engines on Jan. 21 for the 40-mile ride in the woods, from trendy downtown Harbor Springs to Larks Lake. Beyond a great ride, there is a tasty reason to do the Moosejaw Safari. Suspended over an open fire at Larks Lake will be the biggest pot of bean soup you’ll ever see, so big they use canoe paddles to stir it. Better have two bowls to keep you warm for the ride back. For more information or to rent a snowmobile, call Countywide Services at (231-347-8822). If your competitive spirit burns too hot for a simple walk in the woods this winter, snowshoe racing may be more your speed. The largest and best race in Michigan is the Bigfoot Boogie (231-932-5401 or www.runsnow.com) slated for Jan. 28 at Timber Ridge Nordic Center (231-947-2770) in Traverse City. The event includes a 5- and 10-kilometer race along a wooded trail. Afterward, everybody warms up with bowls of chili and cups of hot cider. Last year, a record field of 250 folks, many of whom were wearing snowshoes for the first time, were at the starting line. To practice, rent a high-tech pair at the REI Outfitters in Troy (248-689-4402) and Northville (248-347-2100) for $15 a day and $7 for every additional day and hit the trails in a local Metropark. Turn that refrigerator box into a sled and take it to the Petoskey Winter Carnival (800-845-2828 or www.boynecountry.com) on Feb. 18. The highlight of one of Michigan’s oldest winter festivals is the Cardboard Challenge, which involves a field of 30 to 40 sleds – some ingeniously designed and decorated and all of them filled with kids – racing down the ski hill at the Petoskey Winter Sports Park. But be forewarned; it’s tough to beat the locals, who have turned cardboard sleds into a corrugated science. Luge is the daredevil sport of the Winter Olympics, the one where athletes lie feet-first on a tiny sled and rocket down an icy track. If you’ve ever felt moved to give it a shot yourself, head to the Muskegon Winter Sports Complex (877-879-5843 or www.msports.org). Every weekend, it holds luge clinics, teaching steering and sliding techniques on its 550-foot long track. By the end of the two-hour clinic, everybody is competing in timed races. The clinics are $32 for adults and $25 for children. Break the winter doldrums with a trip to the Thunder Bay Resort (800-729-9375 or www.thunderbayresort.com), where you can enjoy a horse-drawn sleigh ride through the woods to a cozy cabin warmed by a fieldstone fireplace. Along the way, you’ll stop to view elk, and at the cabin you’ll indulge in a five-course gourmet dinner and a bottle of wine from a carefully selected list. The evening ends with a return sleigh ride under the stars, with you snuggled under wool blankets. The elk-viewing dinners are offered Saturday and Sunday through mid-March and are $79 per person. Weekend package deals start at $174 per person. If you think football Saturdays are a big deal, venture to the 2006 Island Resort and Casino Continental Cup Tournament (800-236-2447 or www.kiwanisskiclub.com), site of the biggest tailgate party in the Upper Peninsula. On Feb. 18-19, 8,000 people gather around the Pine Mountain Ski Jump in Iron Mountain to grill bratwurst, enjoy a beer and watch the country’s best ski jumpers fly several hundred feet through the air. You’ll practically be in Wisconsin, so wear a Green Bay Packers parka and they won’t know you’re a Flatlander. Nowhere in Michigan is downhill skiing more affordable for rookies than at Nub’s Nob (800-754-6827 or www.nubsnob.com) near Harbor Springs. Rated the fourth-best resort in the Midwest by Ski magazine, Nub’s Nob lets beginners – kids, parents and anyone not sure about this “snowboarding thing” – ski free on a wide, gentle run called Big Time, which is serviced by a chairlift, not a towrope. To the south, tubing is tops at Pando Winter Sports Park (616-874-8343 or www.pandopark.com) near Grand Rapids. This was Michigan’s first tubing park, and it’s still one of the best; a long hill with five different runs ranging from mellow to maddening. Tubing is often described as whitewater rafting on snow – and you don’t have to worry about climbing the hill. Special lifts pull your tube back up, with you in it. Who says you have to go outdoors to cure cabin fever? Check into the Grand Traverse Resort (800-236-1577 or www.grandtraverseresort.com), where you can spend a day covered in mud at the spa, play tennis, shop, dine at one of four restaurants and never step outside all weekend. A spa package is $327 per person on the weekend and includes two nights of accommodations, breakfast in the morning and two spa treatments, ranging from a stress-relief wrap to a cherries-and-cream bath. Another stunning spa getaway can be found at Boyne’s Mountain Grand Lodge and Spa (800-462-6963 or www.mountaingrandlodge.com), which offers every service imaginable in its 18,000-square-foot Solace Spa. Grab your kids and your Flexible Flyer and head to Maybury State Park in Northville (248-349-8390), home of Wayne County’s best sledding hill. The adventure begins with a quarter-mile walk through the forest from the parking lot off Eight Mile Road (west of Beck Road) to this imposing hill. A dozen runs down and most 5-year-olds and their parents are ready for hot chocolate. The rink may not be Olympic-size, but it’s hard to imagine a more beautiful spot to practice your triple axel than at Campus Martius (313-963-9393) in downtown Detroit. Rent a pair of skates and glide effortlessly across the outdoor rink with the stars above and the city skyline all around you. On Friday and Saturday, you can skate until midnight and then walk over to Lafayette Coney Island afterward for a loose burger and a plate of chili fries. For a rustic getaway in the woods that’s a world away from your hectic life, look no farther than the Holly Recreation Area (248-634-8811). Up to six people can pile comfortably into the Rolston Cabin, where electricity is the only amenity. Okay, so it doesn’t have indoor plumbing and the outhouse seat can be frosty in the morning, but there is something relaxing about being snowbound in a log cabin overlooking a pond and your only concern is making sure the fire doesn’t go out at night. The cabin is $70 a night and needs to be reserved well in advance, since it’s become a popular winter escape. Though some species might be contemplating hibernation, the best time to visit the polar bears at the Detroit Zoo (248-398-0900 or www.detroit zoo.org) is during winter. The colder it is, the more active those Arctic animals are. The zoo’s Arctic Ring of Life is the world’s largest polar bear exhibit, a four-acre slice of the North Pole. The highlight is the Polar Passage, a 70-foot-long clear tunnel where you can view seals and polar bears swimming among the icebergs from below. Just watching the new polar bear cub play is worth the price of admission. Fresh snow is nice, but not necessary at Waterford Oaks County Park (248-975-4440), home of Michigan’s only refrigerated toboggan run. The Fridge is operational in temperatures as warm as 45 degrees, which means you can take the family for a ride even during those fluky “warm” winter days. The run is 1,000 feet long – the length of three football fields – with a vertical drop of 55 feet, enabling you to reach speeds of up to 35 mph. Admission ranges from $3-$9, and toboggans (and staff to haul it back to the top) are provided. Chefs, culinary instructors and professional carving teams from as far away as Japan, Russia and Norway turn Plymouth into a fantasyland Jan. 16-22 with more than 150 sculptures. The Plymouth International Ice Sculpture Spectacular (734-459-9157 or www.plymouthice.com) is North America’s oldest and largest ice-carving event. The best time to come is early evening, when colorful lights backlight the glistening works of art. 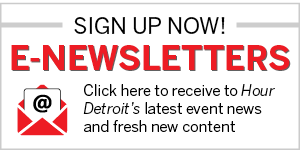 You may not have a ticket to Super Bowl XL, but everyone can get a fun front-row seat Feb. 2-5 at downtown Detroit’s big festival, the Motown Winter Blast (313-963-8418 or www.motownwinterblast.com). Centered at Campus Martius, the festival includes everything from a giant snow maze for kids and a 200-foot-long snow slide to snowshoe races, sled-dog exhibitions and snowmen competitions. Keep warm with more than 60 toe-tapping, hip-hopping bands performing on four stages – in heated tents, of course. Sure it’s short, but “The Wall” at Pine Knob Ski Resort (248-625-0800 or www.skipineknob.com) is very steep and loaded with moguls. One trip down and you’ll understand why it’s the toughest double black-diamond slope in southeast Michigan. For the fastest ride uphill, slide over to Mount Holly (800-582-7256 or www.skimtholly.com), where the Mach 1 Express Superlift, southeast Michigan’s only high-speed detachable chairlift, is like a ride at Cedar Point and often more fun for beginners than the skiing. There are more than 80 miles of snowmobile trails on Drummond Island, but the main attraction for sled-heads is following ice trails across frozen Lake Huron to Canada. Three trails depart from the island to Ontario and are marked with Christmas trees (tinsel and all) with the longest being a 28-mile circular route around the island. If you’re brave (or really bored) this winter, contact Drummond Island Resort (800-999-6343 or www.drummondisland.com) about lodging, snowmobile rentals or guided tours. Winter is no time to hit the beach unless you’re a polar bear – or it’s for charity. Dipps for Toys is an annual event in which the bravehearted and the foolish meet at Honest John’s Bar (313-832-5646) in Detroit on Dec. 4 and then head over to Belle Isle for a swim. It may sound crazy – one year the temperature was minus 5 when they took the plunge – but since 1990 this event has raised $1.3 million for kids. That’s a lot of cold cash for a good cause. All across Michigan, a small but hardy group of campers continue enjoying their favorite activity long after the rest of us have parked the trailer and put away the tents. Winter camping is offered at nine state parks, but only Mitchell State Park (231-775-7911), near Cadillac and Traverse City State Park (231-922-5270), have heated restrooms, an important consideration when trying to decide where to set up camp in February. This park in Boyne City (231-582-6597) ranks as the meanest sledding hill in the state, so steep and fast it was a downhill ski slope in the 1950s. The chairlift was replaced with a 462-step stairway to the top, but few actually make it to the peak. Most kids haul their sled only halfway up – and still have trouble making it down right side up. Make sure you’re wearing clean underwear because this hill is going to scare the pants off you. The sign that greets you at Mount Bohemia Ski Resort (888-937-2411 or www.mtbohemia.com) is “No Beginners Allowed!” That’s because glade skiing (off the groomed or beaten path) rules at this Keweenaw Peninsula ski area, which has 41 runs but not a single beginner’s slope. In a forested section known as Extreme Backcountry, 14 runs are riddled with 30-foot rock cliffs, snow-filled chutes and a lot of large pines. It’s rated triple black diamond only because they couldn’t fit four of them on the trail signs. The best groomed cross-country trails in southeast Michigan are at Independence Oaks County Park (248-625-0877), which is important because this park near Clarkston is also home to the biggest hills in Oakland County. One trail, Ted Gray, is a steep, almost suicidal downhill run with a sharp dogleg in the middle. If the sonic-like speed doesn’t topple you, good luck making it through the sudden curve. The high point of Crystal Mountain’s Spring Fling is the annual Jiggle Jump scheduled at the Thompsonville ski resort (231-378-2000 or www.crystalmountain.com) for March 25-26. There’s no better way to end this long season than watching skiers and snowboarders trying to hydroplane across a 20-yard-long trough filled with 650 gallons of green gelatin. It’s fun to watch, but are you crazy enough to try it? How long has your winter been?